Niche: Creating a gap-analysis for businesses making $2million/year, to grow to the next level. 1. Where Kathy was before joining Consulting Accelerator. 2. What Kathy’s business looked like before Consulting Accelerator. 3. The major flaws she found while working as a contractor. 4. The shift Kathy made once she joined the program to start landing clients. 5. How Kathy packages and prices her offer to his clients. 6. How to keep away the noise as your success grows. 7. The importance of staying focused on the niche and their problem. 8. The most transformative part of the program for Kathy. Stay focused on your niche and the problem they experience. Sam Ovens:	Hey, everyone. Sam Ovens here. And today I have Kathy Rimmer on with us. And Kathy joined Consulting Accelerator when she already had her business. At the point when she joined, she was making about $1000 per month and since joining, she's been able to grow up to about $3000 per month. What Kathy does is she helps small businesses in her local area to grow and to really scale up. And in today's interview, we're going to talk about how she got started and how she gets her clients and also how she was able to go from 1K to 3K a month since joining the program. Thanks for jumping on. Kathy Rimmer:	Thank you for having me, Sam. Yeah. Sam Ovens:	Why don't we talk about when you first joined Consulting Accelerator. What was going on at that point and why did you want to join? Kathy Rimmer:	I had had a chronic illness. So I had to give up my career and change. I took 12 months off of my career to work out where I wanted to head, and I became a trainer, and I worked out as a trainer. In Australia, we have registered training organizations. It was a lot of work, and the hourly rate wasn't so [inaudible 00:01:23]. I looked a lot into gazelles so then scaling up, etc. and Rockefeller habit so I had an idea I wanted to scale up at some point, and your consulting program popped up as a really good option. Sam Ovens:	And what made you want to join it? Kathy Rimmer:	That it had ... it was everything in one place. It was mindset. It was the online component. You could watch it at any time. Where I found a lot of the other work you had to look at different resources and combine them. Sam Ovens:	Got it. And then at that time when you joined, you had your business. You were making around 1K per month and you wanted to grow. Kathy Rimmer:	Yes. Sam Ovens:	And so you thought Consulting Accelerator would help you with that. Kathy Rimmer:	Mm-hmm (affirmative). Sam Ovens:	And what ... let's talk about what your business was doing exactly back then. When you were making 1K a month before Accelerator, explain what you did. Kathy Rimmer:	What I was doing is a lot of hours and I hit the glass ceiling where I couldn't trade time for dollars anymore. I was working as many hours as I could. It was only $80 per assessment, and I'd have to see someone four times, sometimes to get an assessment in for the training organization. Sam Ovens:	What was the training organization? Kathy Rimmer:	It was called Lexon Consultants. And so myself as a contractor trainer I wasn't putting super anything inside either. So it's something that ... and some of it involved travel as well. If I was face to face, I think it was only $30 an hour. It wasn't a great deal. I was certainly working the hours but I wasn't getting the income. I was working as many hours as I could. Sam Ovens:	Got it. So you were basically working as a contractor trainer for some other company? Kathy Rimmer:	Yes, correct. Yeah, yeah. Sam Ovens:	Okay. And then what assessment were you doing? Kathy Rimmer:	Part of it I would do a certificate for [inaudible 00:03:43] certificate and they would have, for example, anywhere from eight to 10 units to complete one per month and I was the one doing all the follow up and a lot of the time I was the one bringing the business in because people were coming to me anyway. I'd sign them up and a huge chunk would be paid to the organization that I was working for as opposed to myself. Sam Ovens:	So who was completing the assessments? You or the client? Kathy Rimmer:	The participants, the students, yeah. Sam Ovens:	Okay, and then they were students. They weren't businesses? Kathy Rimmer:	They were working at businesses but I ended up not realizing at the time I was giving free advice to the business owners. Sam Ovens:	Got it. All right. I understand now. And then when you joined Accelerator, you wanted to start your own business? Kathy Rimmer:	Yeah. I realized that people were coming to me because of me, not the training organization. So yes, I wanted to take control of that and not everyone wanted to get that piece of paper that was a certificate for a diploma. They just wanted to go through the details, and it required staff engagement, the involvement of the business, not just the person learning. Sam Ovens:	Got it. And then so what was the major flaw you observed when you were doing that? Kathy Rimmer:	That I was the one promoting and bringing the business in, yet I was the one getting paid the least. Sam Ovens:	You said that you found that these individuals within a company were doing this diploma or assessment thing to get at the end a piece of paper which made no real difference to them or the business. Kathy Rimmer:	No, no. And at the end, and I at times would have to really be pushing people why haven't you got this done? This needs to be finished. Okay. I'll come out and see you more often. They weren't motivated, and the piece of paper wasn't the motivation. They required extra or different techniques to here you go, here's the work. You complete that. Sam Ovens:	They probably had a good reason not to be motivated because it's kind of pointless in the first place. Kathy Rimmer:	Yeah, yeah. And it wasn't current as well. It wasn't up to date with the technology that was happening. Most of it was outdated. Sam Ovens:	It's actually abnormal to be motivated to do something pointless. Kathy Rimmer:	Yeah, yeah. And it was the business saying to the student, whoa you're a trainee. You need to do these or we need our supervisors trained. This is what you need to do. It wasn't coming from the person always. Those that came themselves were motivated. Those that were externally motivated really struggled. Sam Ovens:	Got it. And then so you joined Consultant Accelerator and then what happened next? Kathy Rimmer:	I started to shift where I overcame sort out because my previous role I had a lot of experience with [inaudible 00:06:41] Societies, and I didn't realize I was giving that free advice. So I started charging for that advice and making more money doing that without the best paper. And one people had that option, they stopped signing up to the training organization because they could get current information, what was working for businesses at the time and [inaudible 00:07:02]. Sam Ovens:	So who were you ... you went through the program. One of the first steps we get you to do is to pick a niche. What did you pick as your niche? Kathy Rimmer:	It is small business so it is helping those under two million because in Australia if your turnover is less than two million, you count it as a hobby business. So I want to help those guys get to the next level. Sam Ovens:	Okay. Kathy Rimmer:	Yeah, to get turnover two million and exit strategy. I'm very, very good at those that are going to sell their business to getting systems in place and policies and procedures to add extra to the sellable amount. Sam Ovens:	Got it. And so the niche is small businesses in your local market. The problem they have is that they want to grow. Kathy Rimmer:	Yes. Sam Ovens:	And they probably don't know how or they tried and it hasn't worked. And how do you help them with that? Kathy Rimmer:	That's where I do a range of things. Some businesses don't quite have the income yet so that's where we've developed the quarterly business planning workshops. What I ... one of the roadblocks I found was it was taking me three to six months to get their mindset right. We're in a group setting in the quarterly conference. It removes that barrier of expense, but as a group they seem to shift their mindset much quicker and more accountability as a group with weekly contact in accountability teams of 10 to 12 people. Sam Ovens:	Got it. And then let's dig into this problem a little bit. These businesses, they are below two million in revenue. They want to grow. Why can't they grow? What's their problem? Kathy Rimmer:	Their biggest problem is they struggle to delegate. They struggle to outsource. They try and do everything themselves. So there's a range of things that they can outsource such as bookkeeping. For example, I've had one business I'll be talking to later this week. The wife of the pest control company is doing the bookkeeping, and she's not a bookkeeper. So she's decided to sign up and do a bookkeeping qualification. That's not going to turn the dial and earn extra income. The other problem is there's another business I helped that their wages were way too high when we benchmarked them against the tax office. Similar industry. They were paying, I think it was almost 30 percent in wages. They should have been 23 percent. So what they were doing is they were thinking we need more money. Let's make more sales. But what was happening they were bleeding money out of the business so their turnover would increase but so would their expenses. They went ... not necessarily looking at the big picture. Sam Ovens:	Got it. But is that really the cause of why they weren't able to grow? Kathy Rimmer:	The cause is actually I would put it down to ignorance. They didn't realize that what they should be looking at. I offer, although I call it a business plan, it's more a gap analysis. What are you doing and what aren't you doing? And [inaudible 00:10:34]. Sam Ovens:	Got it. Kathy Rimmer:	I've developed 63 questions. They answer online, which helps me identify the gaps we need to fill. Sam Ovens:	Got it. And most of the time what is the thing that they're not doing so that they can grow? Kathy Rimmer:	A lot of it is efficiency. So I'm working with someone who's about to start off his dance studio. They don't have the facilities in place whether it be credit cards or if they're invoicing people or they're taking money. I'm finding there's a lot of businesses here that people want to pay them but they're so slacking in getting how to pay them out or how much they owe. Sam Ovens:	So they basically just run poorly. Kathy Rimmer:	Yeah, yeah. Absolutely, yes. Sam Ovens:	Pretty generic, but it sounds like it. They're just sloppy. 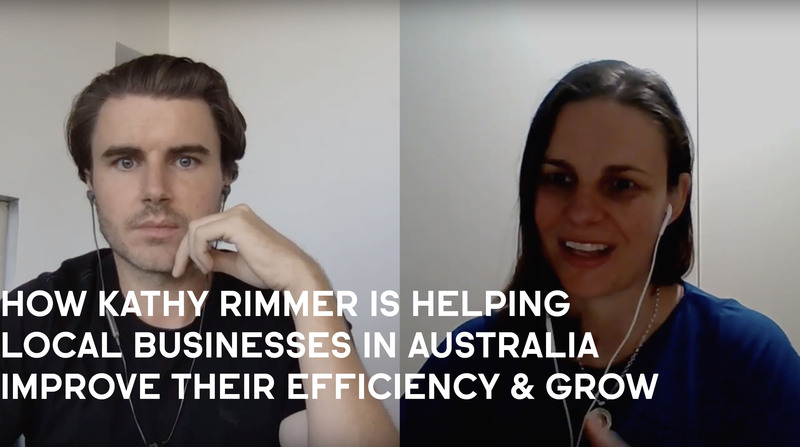 Kathy Rimmer:	Yeah, yeah because they don't know any better and unfortunately [inaudible 00:11:36] itself has 4,700 businesses, and with my kids being young, I'm happy to be around for them at the moment, but we are in the process, my original mentor, we're looking at licensing and franchising the model I'm using. Sam Ovens:	Got it. And then how do you package what you offer? Is there one on one, face to face? Is it ... tell me what's included in what you give to these people. Kathy Rimmer:	Yeah. It includes ... we're offering now so much per month or they pay ... we start them at $135 to test the market, which for a year ... and it is not as much one to one with me. It's more so turning up and teaching them to set goals and be focused is the biggest thing. So those quarterly business planning conferences are the flagship event. They're marketing really well. They're feeling really well. The council's on board. So we get them into that. We have those accountability teams meet once a week on a Monday for what have I set my goals for on a Sunday. On a Tuesday, is a question and answer question which I jump in initially. It will become that [inaudible 00:12:59] once a month. I'm able to help more people in a group setting. If people want to take me on one to one, then it's 350 a month. Sam Ovens:	So how much was the main offer per month? Kathy Rimmer:	The minimum is 135 per month if they want to be part of the quarterly conference. Sam Ovens:	And does that include any one on one? Kathy Rimmer:	Only in that group setting. Sam Ovens:	Okay. Got it. Why so cheap? Kathy Rimmer:	Because it's such a new concept for this area. So it will be going up as of the first of January. We will be putting the price up because we were testing the market at the moment. Yeah, testing the model, making sure that it would work here. So if it can work here, it will work anywhere. Yeah. Sam Ovens:	Yeah, because it seems way too cheap, like $135 a month. Kathy Rimmer:	And there's a business networking group that is not working for people in this area that I've made it comparative with that gro up because there's people leaving that as they come across and once they see the value and I get enough people committing, we can certainly put that out. Sam Ovens:	Got it. So that's how you came up with that price. How much is the business networking thing? Kathy Rimmer:	It is about that much per year, and they meet once a week, but the motivation is not there. Sam Ovens:	It's roughly 135 x 12. That's how much the business networking will cost? Kathy Rimmer:	Yes. Sam Ovens:	Okay. Let's say you got your price. Kathy Rimmer:	It is. It is. And they're training is not efficient while they got the training there. Sam Ovens:	You shouldn't even be comparing yourself to them. Kathy Rimmer:	Yes. That's been my eye opener this last week because I'm not [crosstalk 00:15:04]. Sam Ovens:	People don't come up with prices for no reason. So soon as I hear that 135, I was like where did this come from? Sounds like you've got your eyes fixated on the business networking thing. And they aren't doing a very good job so you thought I'll come in and do a better job and price it around the same. But really what you're doing has nothing to do with the business networking group. You're not doing a business networking thing. Kathy Rimmer:	Yes. Yes. And that is something I've realized in the last week. Yes. As we're talking, the licensing where ... we're re-tweaking the process for the first of July. We're offering master classes as well as part of it. So while we've got the quarterly business planning workshops as the basic, we're also adding a full day master class where we'll have a specialist come in and as part of the licensing we're moving towards making me an owner ... not an owner, operator where I'll have operators running those not just in the Port Stevens area, expanding that reach. Sam Ovens:	Got it. Kathy Rimmer:	We've started videoing the speakers, etc. as part of these conferences. We'll be able to put the price up because the barrier was [inaudible 00:16:24]. So we've removed that barrier by videoing the speakers and we're making that available online. Sam Ovens:	What are the speakers speaking on? Kathy Rimmer:	Various things. Our next one is communicating for impact. So they're talking about ... the guest speaker is talking about sales. We add a local business in as well, but its been doing well. Marketing is in March. We cover values because that's the biggest thing I found. The owners in the business don't know the values that they're operating off of so they're finding mismatches and they're hitting roadblocks and delighting customers and excelling, creating revenue growth and so forth. Yeah. Sam Ovens:	Got it. Kathy Rimmer:	We've themed the speakers around that. Outsourcing is a big thing, getting virtual assistants and because in this area they're quite behind the major cities. The long term goal is to get this area across outsourcing overseas, but also this is such a beautiful spot, making this a business tourism destination as well and having your retreat here once a year. Sam Ovens:	Got it. It sounds like the solution is kind of vague, like a conference with multiple different speakers, speaking on different topics that will be recorded and then put somewhere. It sounds like you don't know what the problem is. Because if we could articulate the problem perfectly, then we'd be able to provide a real just laser targeted solution that just squashes that problem and then fixed. You know what I mean? Kathy Rimmer:	Yeah. What I've identified as the problem doesn't market very well is the thing. Sam Ovens:	What have you identified it as? Kathy Rimmer:	It is the goal setting. They're floating along. They haven't set their destination. They haven't checked where they want to be in five years and what they're doing today will get them there in five years. They're not staying on track and- Sam Ovens:	What's wrong with that? That sounds way more appealing to me because it- Kathy Rimmer:	Yeah, yeah. And I get them to do their [inaudible 00:18:47] first. I offer them 12 months. If your doctor tells you you've got 12 months to live, what would you do each month? And then we get to the end and say the doctors told you you've been misdiagnosed, why aren't you doing those things now and why is that not part of your next 12 months plans? So then we organize the next 12 months. Sam Ovens:	Got it. But why not just focus on that? Why bring in speakers and get them to talk about different things? Kathy Rimmer:	It's more to get their systems in place because if they wanted to sell the business, they need to be able to communicate with their staff, their customers, their ... all of that has to come through where they're going actually. Sam Ovens:	But do the speakers fix that? How do you know the speakers have systems in place? Kathy Rimmer:	I'm pretty selective who I've invited along and since I've been successful, I've recently won a Port Stevens Business Award in this area, the overall business, I've had a lot of people come out of the woodwork that want to be a speaker. And I've said no because they've never worked with me. They've never come to one of our workshops. They just want to jump on the bandwagon. You know? Sam Ovens:	Generally, the people that want to speak shouldn't speak because the people who are worthy of speaking are the ones that are working. Kathy Rimmer:	Yes, yes. Sam Ovens:	Because that's how you get good at it, not by talking about it, by doing it. Kathy Rimmer:	No. Sam Ovens:	And then they don't want to talk about it. They want to keep doing it. Kathy Rimmer:	Yes, yes. Sam Ovens:	[crosstalk 00:20:20] that want to talk about it. Kathy Rimmer:	Yeah, yeah. The people I've selected to speak are those that are doing it and I've had to convince to come down basically to say ... to share their story. Sam Ovens:	But I think [crosstalk 00:20:32] have systems. Kathy Rimmer:	Yeah, yeah. Those ones do, yes, yes. Sam Ovens:	It's almost [crosstalk 00:20:39] zero people to have a really good [inaudible 00:20:41] business with systems. Kathy Rimmer:	They're not at the level, however, it's also giving me the opportunity to get those people to that level as well. Currently in this area, those businesses are more successful than other businesses. And it's trying to do use the [inaudible 00:21:01] rising tide mentality. I'm drawing people from Sydney. I even had a lady come to talk about trademarking. She's one of the best in Australia, and I had the [inaudible 00:21:15] government at the same workshop and what happened is the [inaudible 00:21:21] government [inaudible 00:21:22] from the trademark speaker things that he didn't know about trademarking. And its actually impacted the [inaudible 00:21:28] government. Sam Ovens:	See, this is what I mean. We've got the government there, which is anywhere where the government is probably the last place I want to be. Kathy Rimmer:	Yeah. Sam Ovens:	And then a trademark specialist there and then ... but these people's problems, they don't know how to set goals and they're not even ... they're poor operators. You know what I mean? And now they're sitting there listening to a government person or trademark person. Now they're more confused than ever. Imagine if I had a government person come in to Consulting Accelerator, a trademark person come in. And it was just modules on trademarks. Kathy Rimmer:	I see what you're saying, yeah. It's just stealing the message. Sam Ovens:	It's just being very careful. People come to me all the time and they want to make a module and put it in the program. They're like I think your students should learn about podcasting. Or I think your students should learn about making a YouTube channel. Or I think your students should learn about Bitcoin. It's relentless. If everyone wants to put their little piece in there, which is the equivalent of somebody coming and speaking with you, right? But and then even when we had that ... what was it called? The GDPR. I had these people coming to me. They were like Samuel, students need to know about this GDPR stuff and people are always trying to get in there. And I have to guard the perimeter and be like no, no, no, no, no, no, no, no, no. Because I have to make sure that the only things in there are the things that the people need to achieve their goal Kathy Rimmer:	Okay. Okay. Sam Ovens:	Because otherwise you derail these people. You know what I mean? Kathy Rimmer:	That makes sense. Yeah. Yes. Okay. Sam Ovens:	Because it's like these people's problem isn't a trademark thing. These people's problems are they don't know what they're doing. So they don't know what to do because they don't know what they want. They're confused. And everything's amiss. So giving them more information isn't necessarily the right solution. Kathy Rimmer:	Even if I identified there's a group that need a trademark and I'll put a speaker up to speak to them because they need that? Sam Ovens:	Honestly, it's like these people need more. There's things that are higher up in the priorities list than a trademark. Kathy Rimmer:	Mm-hmm (affirmative). Sam Ovens:	If your business fails, who cares if you got a trademark or not? You know? Kathy Rimmer:	Yes, yes. And they have to have the income to pay for a trademark. Sam Ovens:	Yeah. This is why it just pays to get laser focused on the problem. What is their problem? It sounds like these people don't even know what they want. That creates a problem because if you don't know what you want, how do you possibly know what to do? So now you're doing random things. And you're changing your mind all the time because you don't really know what you want. It's just a big mess. And then you're going to get demotivated because you're not making any steady progress towards any steady thing. It's just a recipe to screw with your brains psychologically and be amiss. Kathy Rimmer:	Okay. Yeah, that makes sense. So somewhere along the line I've lost track of that focus of what that niche is. Sam Ovens:	Yeah. And it sounds like what happened is you got an award and then people started learning about you and this is the thing. It gets everyone. The more successful you get, the more noise starts coming at you. More people, more opportunities, more everything. It just starts bombarding you from every angle. Kathy Rimmer:	Right. Okay. Sam Ovens:	You have to be ... the people who get distracted by that noise, they lose. Kathy Rimmer:	Right, okay. That makes a lot of sense because I was working with an international organization. I was helping, and I was very successful. Actually, I was earning much more than 3000 a month at the time. And one of the ladies that I was helping to look [inaudible 00:26:01] business coaches across Australia for the Canadian company and my strategic business coach left that organization and came to me later and signed me up. You say that I realize I've spent time promoting her. She's partnered with me because I was successful and got me distracted on what she's doing. Okay. Sam Ovens:	Yeah. You just have to stay ... you have to put blinders on. Kathy Rimmer:	Right, okay. Okay. That makes sense because since I got distracted with that is when I lost focused of what my stuff is of being I've worked out that since she came along I've gone backwards I guess. Okay. I think that's what's happened. Sam Ovens:	Yeah because those events do not sound like they're actually helping your niche. I mean, they might. If someone wants to make a friend, maybe they will make a friend. If they want to get some cheap coffee maybe we'll achieve these objectives. But these aren't really their true problems. Some people do appreciate an event. They're like oh, that was a nice event. There were some good sandwiches, and I met some nice people and that's not what we're trying to do. We're not trying to give people good sandwiches and meet people. We're trying to fix the problem. And if it isn't fixing their problem, then don't do it. Kathy Rimmer:	Yes, okay. Yes. That makes a lot of sense. Sam Ovens:	It sounds like you're distracted again also, kind of by the business networking thing. Kathy Rimmer:	That's part of why I left the group, because I was getting .., yes, I was absolutely getting distracted while I was part of that group. Sam Ovens:	It seems like almost trying to create one. Kathy Rimmer:	You know what? You're probably ... yeah, actually you're right there because I've still got those people wanting to see me. So I created something that they can ... okay, yeah. Sam Ovens:	Does the business networking thing have people speak at it? Kathy Rimmer:	If you're a member, yes. Sam Ovens:	So you've mimicked their pricing and you have mimicked what they do subconsciously. You know what I mean? Yeah. So that's thing. That's the attractive field that's been pulling on you. And you needed to let go of that and just focus back on the thing that the problem you're trying to solve for your niche. Kathy Rimmer:	Yeah, okay, okay. That makes sense. Yeah. Yes, yes. And just put that more clearly across what as you said the problem [inaudible 00:28:56]. Sam Ovens:	Yeah, it's the easiest way to ... because I get lost in the weeds every day as well. Everyone does because you're looking inside this thing and it's ... I'll give you an example. You're inside Facebook ad, inside an ad, see it inside an ad, and you're looking at the text in an ad and targeting and the bidding and it's so microscopic. And you can get confused in there about what you're supposed to be doing. But then you've got to zoom out and remember why am I doing this? What am I trying to do? I'm trying to help people that want to start a business, grow a business to start a business or grow a business. And so what am I doing these ads for? Well, I'm doing them so that I can make people aware, so that we can get customers. Kathy Rimmer:	Yes, yes. Sam Ovens:	And you've always got to fact check your ... you've got to fact check yourself multiple times per day that what you're doing is necessary for achieving this goal. Kind of similar to what your clients have. Kathy Rimmer:	Yes. I was just thinking that [inaudible 00:30:03]. Sam Ovens:	Honestly, one of the hardest things in the world to do. Actually, I don't know if that's true. It's one of the least common things that I've ever seen. I really ... I always ask humans when I see them, what's your goal? What are you trying to do with your life? Almost no one knows. It's very, very, very rare that I find anyone that actually does. So- Kathy Rimmer:	Yeah. Sam Ovens:	Helping someone get clarity on that, it's big. I would focus solely on that and then cut out all the other noise. Then you'll probably find you've got so much more time to focus on these crucial things because you're not organizing events and speakers and sandwiches and things like that. You know? Kathy Rimmer:	Absolutely. And to be honest, the most effective thing I have found is that you have 12 months to [inaudible 00:31:01] system and watching people complete that, they very much ... the light bulb goes off of what, and as you said, people don't know what they want to do, but if they think they've only got 12 months to live, they're quite clear on what they would regret and that helps set their goals. Sam Ovens:	Mm-hmm (affirmative). Cool. So what ... yeah, that ended up being kind of consulting session as well as a story. But as I started getting into the story, I was like I couldn't leave my ... I couldn't leave it alone. It needed to be intervened with. You know what I mean? Kathy Rimmer:	Yes, absolutely. Absolutely. Yeah, so thank you so much, Sam. That's ... yes, that explains a lot of what's happening currently in the business. Yeah. Sam Ovens:	Awesome. And going through the program, what was the most helpful part of it for you? Kathy Rimmer:	It was the mindset stuff which I found that I've looked at John D. Martini and various things. Yours was so deep and it was so effective. I found that extremely useful. Yes. And to be honest, probably need to revisit it. Sam Ovens:	Got it. Kathy Rimmer:	Yeah. Sam Ovens:	And what would be your number one piece of advice for other members who are going through the program? Kathy Rimmer:	After our conversation, it would be to really harness in and stick to that problem and niche and articulate that very, very well and not get distracted. Sam Ovens:	That's good advice. And then how can people learn more about you? You said you're in Australia somewhere, right? Kathy Rimmer:	Yes, yes. I am, yes. Sam Ovens:	What particular part? Kathy Rimmer:	It's near New Castle. We're sort of northeast of New Castle, 60 kilometers. Port Stevens. I live a little near a place called Nelson Bay. Most people know that. Sam Ovens:	Got it. And how can people that say some of these people around that area watch this or find it on YouTube. How can they learn more about you? Kathy Rimmer:	They can ... I do have a website which is not ... it's being upgraded at the moment. We're rebuilding. But certainly I do a lot of my consults via Zoom [inaudible 00:33:51]. They can reach out and ... yes, if they're meeting the criteria [inaudible 00:34:00] they can reach out and get a complimentary consultation. Sam Ovens:	Cool. So they just look at the [inaudible 00:34:07] Linkedin or Facebook, something like that? Kathy Rimmer:	Yes, yes, absolutely. It's all over. I haven't gone as big with social media. I certainly do have a presence online if people look for that or [inaudible 00:34:22] consultants. It's all about business for sure. Sam Ovens:	Sure. Awesome. All right. Thanks for taking the time to speak with me and looking forward to speaking with you again soon once you've put those blinders back on and get laser focused on that problem. Kathy Rimmer:	Yes, yes. I'll keep you updated how I've gone with that, Sam. Thank you very much. Sam Ovens:	All right. See ya. Kathy Rimmer:	Great. Thanks. Bye.